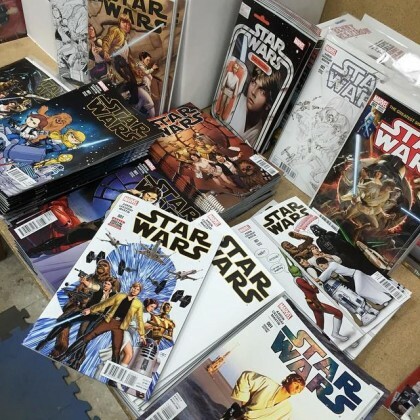 THE HEROESONLINE BLOG | CELEBRATE STAR WARS #1 at HEROES TODAY! CELEBRATE STAR WARS #1 at HEROES TODAY! Join us today to celebrate the release of Star Wars #1 written by our pal Jason Aaron (Thor, Southern Bastards, Wolverine, Scalped) and drawn by John Cassaday (Uncanny Avengers, Planetary, Astonishing X-Men). You may have also heard about the variant covers for this first issue, there are a bunch of them and we have some of them available in store for you today PLUS the 501st Carolina Garrison will be here for photos with customers. We have also listed 8(!) sets of Star Wars #1 variant covers on eBay. Check the listings for all the details of which books are in each set. Of course in true Heroes fashion we’re not only selling comic books. If you win one of the variant sets, you will recieve a 3-day pass to HeroesCon 2015. 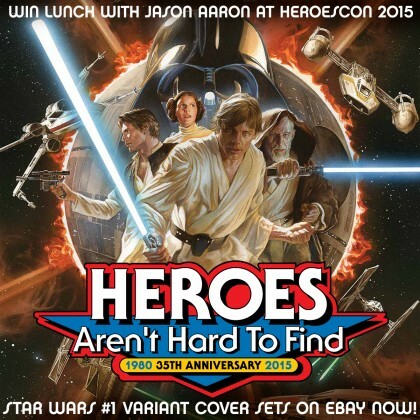 If you are able to attend HeroesCon 2015, you will be invited to a catered BBQ lunch with series writer Jason Aaron! At the lunch you will have the opportunity to get your books signed by Jason and certified (at a discounted rate) by CBCS! Don’t miss this rare opportunity!